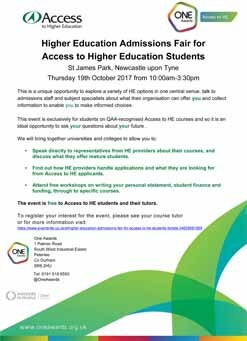 One Awards is delighted to invite you to our annual HE Admissions Fair, this year being held at the amazing St James Park in Newcastle. Our fair is designed exclusively for students enrolled on QAA recognised Access to HE courses across the North of England. We are also delighted to announce that several employers will be attending making this a unique opportunity for you to collect information and discuss employment opportunities in addition to HE advice and guidance. This event is not to be missed and is a perfect occasion for you to make informed choices about your future. Speak directly to representatives from HE providers about their courses, and discuss what they offer mature students. Speak directly with employers about career opportunities available and progression routes after graduation. Find out how HE providers handle applications and what they are looking for from Access to HE applicants. Attend free workshops on writing your personal statement, student finance and funding, through to subject specific courses. The event is free to Access to HE students and their tutors. Following our first Admissions Fair for Access to HE Students in November 2016, we are delighted to continue to facilitate this important event which offers HE Institutions the opportunity to promote their courses, advice and support services to Access to HE students. Last year’s event was the first Higher Education admissions fair for Access to HE Students in the North of England. The event was a success and positive feedback was received on the fantastic opportunity it gave both students and higher education providers to meet up and discuss opportunities available. Feedback from students showed that 75% found out something that they didn’t know or discovered a new university that offered courses they were interested in.